Northland Chipper Sales Ltd. is happy to be back working with Bandit Industries Inc. to bring their impressive line of disc and drum chippers to our customers in Western Canada. 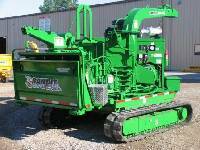 We have over twenty years of experience with Bandit chippers and believe that you will benefit by adding some of their extensive line of hand fed chippers and stump grinders to your wood chipper operation. Disc chippers. Tough, efficient, trouble free. powerful, compact unit, 6 x 12-inch wide chipper throat, gas and diesel engine options from 27 to 44.2 HP. A compact, tough and very capable 7' chipper. Similar to model 90, except the disk is at 90 degree angle. Largest 12' model, the ultimate productive yet compact chipper. Engine options from 114 to 215 HP. Most productive hand-fed disc-style chipper available. Can handle large diameter whole trees. Hydraulic Fed Drum chippers. Bigger, sturdier drums and rugged construction. Featured Customer: Vancouver Island Tree Service Ltd. Double Take - must see this! Engine options from 84.5 to 142 HP. Easily the best 18-inch capacity chipper. We have one on order, call now for details. The most versatile 19-inch capacity drum-style chipper available. All Bandit hand-fed chippers are offered as a self-propelled version. These highly maneuverable units eliminate the need to forward or skid material to the chipper, the chipper can be taken to the trees! Please contact us, and we can help you select the right model for your needs. Most Bandit chippers are available with a grapple. Please contact us today, and we can share with you the benefits of a grapple, and which model would best work for your specific needs. Chipper with chip box combo. If you don't need a chip truck or you want to fill the chip truck then chip with the chipper combo while the truck is dumping, then fill the truck again and then take the full truck and the full chipper chip box combo to the dump at the same time. Chipper/chip box combo's are available on the following models: 65xl, 90, and 95. Bandit offers the following models as pto units: 65xp, 90xp, 95xp, 150xp, 200xp, and 250xp. These units can be ordered as 3-point hitch units or a trailerized units that can easily be manuvered around from one location to the next. There is no substitute for the right tool for the job. One FEED ROLLER or two?